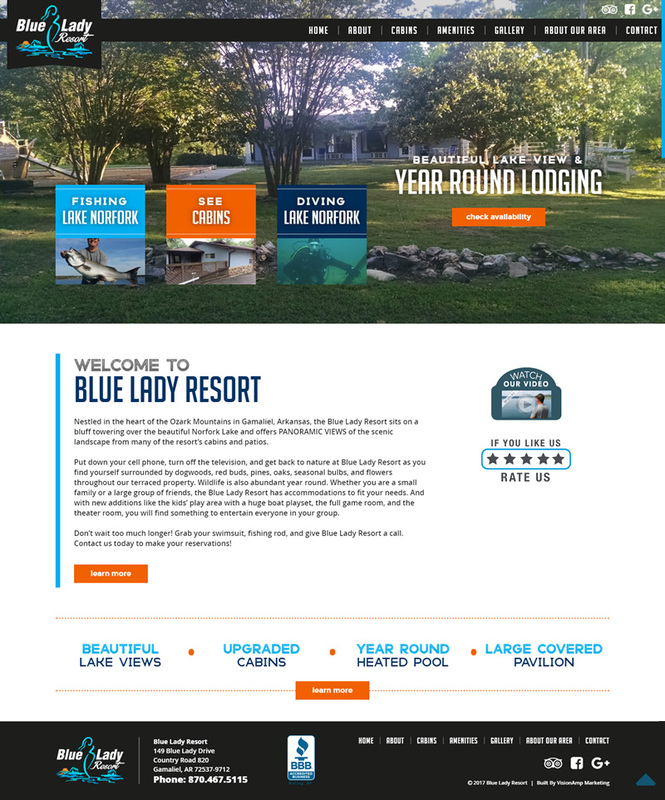 Blue Lady Resort needed a mobile friendly website rebuild. We worked with the client to design a site that was visually appealing and was fully responsive, working well on all devices. The new website uses their online booking software to make online reservations; that was a main call to action for the client. The site also offers things to do in our area, and showcases their beautiful lake views with large imagery. Blue Lady Resort sits on a bluff overlooking beautiful Norfork Lake and the Ozark Mountains in Gamaliel, Arkansas. They offer one, two and three bedroom cabins, a beautiful lakeside pool, a lighted boat dock with swim deck and fishing decks. Blue Lady Resort is the perfect peaceful getaway for hunting, fishing, boating, swimming, hiking, or simply spending restful days by the pool overlooking Norfork Lake.